"Armidale" redirects here. For other uses, see Armidale (disambiguation). 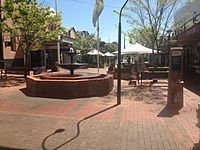 Armidale is on the banks of Dumaresq Creek, in the Northern Tablelands in the New England region about midway between Sydney and Brisbane at an altitude (980 m AHD) ranging from 970 metres at the valley's floor to 1,110 metres above sea level at the crests of the hills. A short distance to the east of Armidale are heavily forested steep gorges dropping down to the eastern coastal plain. Large parts of the highlands are covered by Palaeozoic aged metamorphosed sedimentary rocks. Intruding into these meta-sediments are granite plutons which decompose to form sandy soil, slightly deficient in nutrients. There are also basalt flows which are more fertile for the soil substrates. Those areas away from the deep gorge country tend to display gently undulating terrain mainly used for pastures and where granites occur the areas are usually covered in bushland. The area contains a number of areas of outstanding natural beauty and scientific interest as well as several World Heritage national parks in the area including the New England National Park and the Oxley Wild Rivers National Park. To the west is Mount Yarrowyck Nature Reserve. The coastal plain can be reached directly at Coffs Harbour via Waterfall Way to Dorrigo and Bellingen on the Bellinger River, a two-hour drive. Armidale has a noted problem with air pollution caused by the use of solid fuel domestic wood heaters during the winter months. A peer-reviewed study carried out by the University of New England found winter woodsmoke causes 8.8 additional visits per day to GPs in Armidale for respiratory complaints, i.e., about 750 additional visits per year. Another peer-reviewed study estimated the use of wood heaters in Armidale was responsible for about 11.5 premature deaths per year with estimated annual health cost of $14.95 million - about $4720 per year for every woodheater in the city. A local retired doctor (now Associate Professor at the UNE Medical school) said he is so concerned by the wood smoke situation, he urges people with respiratory problems to leave town. Armidale has a subtropical highland climate (Köppen climate classification: Cfb) influence. Armidale's elevation gives it a milder climate, but the summers are still very warm. Winters are long and cool, with many frosty nights. Snowfall is extremely rare, on average only one day in every three years. The presence of four distinct seasons, unlike most of the rest of Australia, is the reason for the "New England" moniker and the autumn colours are a notable feature of the city. Summers are characterised by warm to very warm days followed almost always by cool, sometimes cold, nights. Thunderstorms often produce heavy falls of rain and occasionally hail in the afternoons and early evenings, also bringing a sudden drop in temperature. Unlike nearby coastal areas, Armidale does not usually experience high humidity levels making most of the summer days quite comfortable. Temperatures exceed 30 °C on average of 13 days per year, but rarely reach higher than 35 °C. The highest temperature recorded at Armidale Airport was 37.0 °C, recorded in January 2014. As the leaves turn yellow and fall, day temperatures are mostly still warm, particularly in March and April. Days are sunny, the thunderstorm season is over, and rain becomes more sporadic. Nights become colder, and residents often awake to a thick fog blanketing the Armidale valley, but by 9 am fogs have cleared to be followed by a bright sunny day. The year's first frosts usually occur in April, but they are not severe. Winters are cold; overnight temperatures drop below −5 °C with frost on the ground. These cold frosty mornings are usually followed by sunny days. Day temperatures may make it as high as 16 °C, but sometimes may not climb beyond 10 °C. These are typical Northern Tablelands winter days with westerly winds, bleak grey clouds, and showers of rain and very occasionally snow. Rainfalls during the winter months is usually light. In spring temperatures are warmer, although occasional morning frosts still can continue well into October. September is usually a pleasantly mild but windy month, and by late October with increasing heat and humidity the thunderstorm season is starting with increasing rainfalls. The spring months produce the most variable weather of the year. A week of very warm sunny weather can be followed by several milder days with temperatures right back at winter levels before gradually warming up again. This cycle often repeats itself many times until the start of summer. 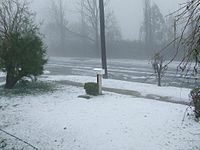 Armidale has been prone to severe hailstorms and has experienced three such storms over a period of ten years. Armidale railway station is on the Main North railway line and is served by daily passenger trains to and from Sydney. Armidale's modern airport has five daily scheduled flights to and from Sydney with Qantaslink. Regional airline Fly Corporate operates a scheduled air service with flights to and from Brisbane. Armidale Airport, at 1,084 metres (3,556 ft), is the highest licensed airport in New South Wales. The city is linked further north by daily coach to Tenterfield provided by NSW TrainLink. Other bus companies such as Greyhound also provide numerous daily services. Local city services are provided on six different routes by Edwards Coaches and Armidale is serviced by 16 taxis. Although the hills to the north and the south can be a challenge, cycling is an option to get around Armidale. A cycleway exists from the University of New England through the city to the residential areas on the eastern side of city. This cycleway snakes back towards Ben Venue School. The passage through the city provides easy access for cyclists to the shopping centres. Bicycle racks are in strategic locations around the city centre, including at The Armidale Food Emporium, The Armidale Plaza, and Centro Armidale. Places are also provided outside the Armidale Dumeresq War Memorial Library, and at either end of the Mall. A maze of marked cycleways on the shoulder of the roads in the city's southern residential areas allows cyclists to safely ride on the roads. There are also separate cycleways from the Armidale Arboretum along Kellys Plains Road to the south and from the north of the city along Rockvale Road to the Armidale State forest (known as the Pine Forest by locals). Before the British colonial settlement of New South Wales, the Indigenous Anēwan people occupied the area that encompasses current day Armidale. 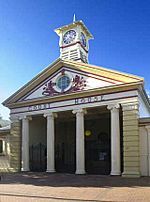 Armidale was first settled in the early 1830s, following the earlier exploration of the area by John Oxley. It was named after Armadale on the Isle of Skye in Scotland, the ancestral home of George James McDonald, the Commissioner for Crown Lands in the late 1830s. Oxley recommended the region for grazing, and soon early pioneers set up small farms in the locality. Armidale Post Office opened on 1 April 1843. The town, which was surveyed in 1848 and gazetted in 1849, was established to provide a market and administration for the farms, but soon after gold was discovered at nearby Rocky River and Gara Gorges, and a gold rush ensued, enlarging the town rapidly in the 1850s. The gold mining settlement of Hillgrove about 40 km east of Armidale was supplied by electricity from Australia's first hydro-electric scheme, remains of which are still visible on the Gara River below the Blue Hole at Castledoyle. The nearby town of Uralla holds the grave of the famous Captain Thunderbolt - outlaw Fred Ward - who caused trouble in the area in the 1860s. As with Ned Kelly, the locals have adopted him as a larrikin hero and make the most of him as a tourist attraction. Armidale was proclaimed a city in 1885. 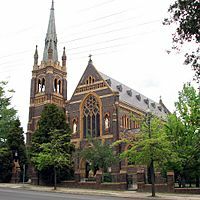 It is a cathedral city, being the seat of the Anglican and Roman Catholic bishops of Armidale. St Peter's Anglican Cathedral, which replaced the original St Peter's Church, was designed by the Canadian architect, John Horbury Hunt who also designed Booloominbah at the University of New England. St Peter's Cathedral opened for worship in 1875 and the tower was added in 1938. The Catholic Cathedral of St Mary and St Joseph was dedicated on December 12, 1919. Central Armidale. A A$49 million development anchored by a Woolworths, Big W and 32 speciality stores. It began trading under the name 'Centro' in late November 2007, and was rebranded 'Central' in 2014. Armidale Plaza, a A$70 million venture, officially opened an extension, refurbishment and rebranding (formerly Kmart Plaza) in August 2007. Armidale Plaza is anchored by Kmart, Target Country, IGA and 50 specialty stores. Bi-Lo was one of the anchor stores until it closed on 28 February 2010. IGA became an anchor store where it opened there on November 8th 2011. Armidale, New South Wales Facts for Kids. Kiddle Encyclopedia.